Today I wanted to talk about how you can get more traffic from Youtube to your OWN websites. In fact, it doesn’t even have to your own sites, it could even be affiliate links. With Youtube being the worlds second largest search engine it makes sense that you would want to grab some of their visitors and send them over to your sites. Right? Over recent weeks I have been asked by a few of my subscribers “How do some people link to EXTERNAL sites in Youtube?” So I thought I would put together a blog post showing you how to do this. Lots of people just add their links in the description area below their video and then use an annotation within the video to encourage them to “click” that link. However, it is FAR more effective to have a clickable annotation within the video itself that will take the viewer straight to a URL of your choice. 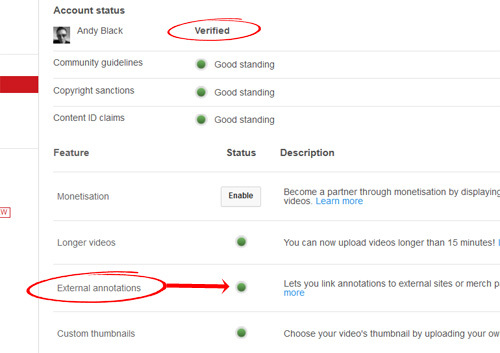 For those of you that do not know what an “annotation” is, it is a peice of textual content that you can display over your video content at any specific time and the really good thing about this is that you can do all of this EASILY from within Youtube itself. 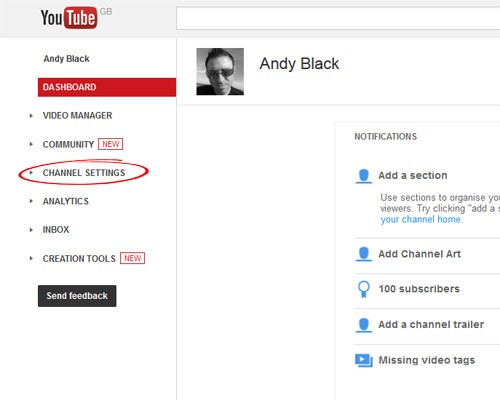 If you have not verified your account it will tell you in your Youtube Dashboard and it only takes a minute to do. It basically confirms your account which helps to cut down on spammers. The first thing you need to do is log into your Youtube account and from your “dashboard” click on “Channel Settings” as shown above. Then you need to check that your account is VERIFIED. If it isn’t verified then simply click on the link / button and follow the simple instructions in order to verify your account. You will also see in the above screenshot that my account is in “Good Standing”. Check that yours is also in good standing. If it is then you are READY to move on. From your channel settings click on the “Advanced” tab. You will see a section that is labelled “Associated website”. This is where you can associate one of your websites with your Yotube account. Add one of your site and add it. Now what this means is that you are now able to link to any pages from that site directly from your Youtube videos. If you are now wondering how you can add affiliates link… simple… using re-directs. If you are using WordPress simple download and install a FREE plugin called “Pretty Links”. This allows you to generate URLs that re-direct to ANY ppage of your choice.. including affiliate links. Pretty Links will also tracks clicks too so you can find out how successful your new Youtube marketing campaigns are doing. 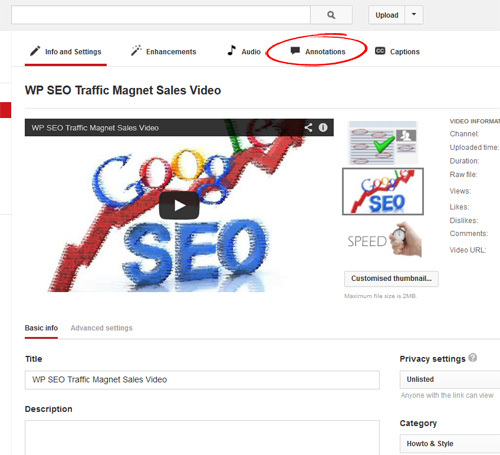 Once you have added your “Associated Website” you can add clickable links to ANY of your Youtube Videos. Once you have uploaded a video click on your “Video Manager” tab and select the video you would like to add clickable annotations too. Then (as shown above) click on on the “Annotations” link. You can then add your annotation. To make it link to your EXTERNAL URL simply check the “Link” checkbox and select “Associated Website” from the dropdown menu. 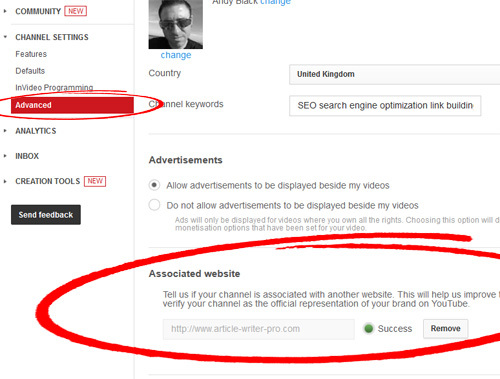 Then enter the URL or link that “re-directs” to your chosen affiliate link etc. This must be from your associated website. 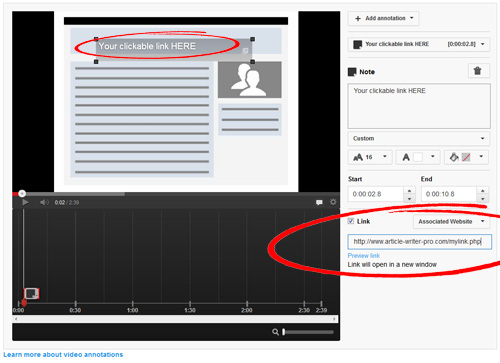 Simply save and you now have a video that links directly to your chosen URL from within your Youtube video. This can drastically increase the amount of traffic you get from Youtube.. and believe me, there is a TON of it. TIP: Lots of people only watch the first minute or two of a video unless it is REALLY relevant and engaging so it’s wide to add a small annotation along the bottom or twop of your video that displays throughout the WHOLE duration of your video. Alternatively have you annotion show up after about 15-20 seconds and then also towards the end. I hope you enjoyed this blog post and put this Youtube technique into action. Very nice post and I feel that it’s a little underground secret not many know about. I crafted a similar post on my blog a few weeks back. Always up for reading and considering anything on youtube opting. Thanks for posting this. I am setting up my Web Site Now. Excellent tip!!! Thanks for posting it. Things in the various Google properties change continually, so having a good source to give us the heads up is important. Cool, will have to try this out. Very useful, very clearly explained. Thanks foe this gift. OK sussed it – there was a message at the top of the page asking me to verify annotations for external websites ! Good post Andy. It is the kind of post I like writing when I get my act together. This is a quality youtube tip! Thanks. Great Info, that’s the reason I keep coming to your site! I love how straightforward the directions are. Thanks so much for sharing! Like the blog as well, very clean mate. Nice tip Andy. Very useful. Thanks for sharing. Hi Si, thanks for commenting. Can you confirm whether you added an “Associated Website” or not? This needs to be done in the settings before being able to add it in the annotation. This post is the medicine for the illeness. Thank you for the free cure. Very useful, and good clear instructions in the screenshots. Hey Andy, some great tips here. I’m not getting the option of ‘Associated Website’ in the drop down box for some reason? I have added an associated website and it is showing a green tab and ‘Success’. My account is verified etc. Does it take a day or to to show? Great timing I am just working on a YouTube video right now and will be doing this on all my videos from now on. Ignore me! I also missed the link to enable external annotations that popped up on my page! Thanks again for the tips Andy! Super stuff from a guy who is truly a ninja for you tube! Wow… some really great tips and tricks here! I was wondering how people were doing some of the cool things they are doing… now you told me that and more! Thanks!!!! Interesting! Very useful info andy. Been wondering how the hell they link youtube annotations to external sites. Now i know and can do it for my clients. Thanks for the Data. I knew you could do this but I never took the time to find out how. You made it simple. Yes, and you can take that a very effective stage further too. You can overlay an YouTube ad creative that directs viewers to your website (or other if you utilize a redirect script), with an image precursor also. I like to use an image of a “Play” button to tempt the curious. You should also explain the downside, which is you must ‘enable’ the monetisation feature in the settings to make all above features available, including external URL hyperlinks. Meaning; Google ads can pop-up inside your video at any time, including total takeover video ads which can hijack you video content for as long as 30 seconds to 90 seconds, and triggered by the number of views your video gets (popularity)…. So if you are willing to give up control of you video to that level, and make some small coin in the process, that’s fine. The good news is, most videos (especially marketing type videos) never get enough views to trigger the total takeover ads, but you will still experience those annoying lower third pop-under ads. But hey, it’s Google game and they make the rules. Personally I’m happy to play Google’s game while I’m making money. I see it as a symbiotic arrangement where both sides (the content provider & YouTube) get something out of it. I like Paul Boyer’s suggestion where you have a call to action image appear in the video, and then annotate that in YouTube… That’s what I call imaginative. Hi Glenn, thanks for your comment but you are wrong about the “Monetization” feature. I do not have “Monetization” enabled on my channel and yet I use my “Associated website” external links on a number of my videos. The monetization is purely if you want to profit from Youtubes advertising platform. I have it de-activated and still use external links in my videos. You just need your Youtube account to be verified and in “good standing”.